One of the first things I saw when looking at the cover of this book was the quote from Melina Marchetta. At the same moment Billy has his first kiss (with an older woman who runs away when she realises how young he is), his Yiayia (Grandmother) collapses in church. This results in a stay in hospital waiting to have her gall stones removed. It’s at the beginning of her hospital stay that Bill’s Yiaya gives him two notes. The first takes him to Melbourne , where he comes face to face with a past he isn’t ready to deal with. The second is a list of three things his Yiayia wants him to do…a bucket list. Bill is convinced it can’t be a bucket list because no one dies from gall stones do they? There comes a time in every boy’s life when his mother asks him to proof read her sexts? No? Just me? OK then. The more tragic moments come in degrees, like the moment where the guy Lucas was chatting up throws his number away when he sees’s his crutches, and Bill sees it. It’s only a small thing, but it gives us a feeling about Lucas’ life, and the boys friendship. There are bigger issues too, family issues, dealing with loss, anger, rejection. I can’t NOT compare it to Looking For Alibrandi, mainly because of the quote on the front of the book, but there are obvious similarities. This is a story that has definite ethnic roots, a Greek Australian family whose culture is kept alive by the older generation. 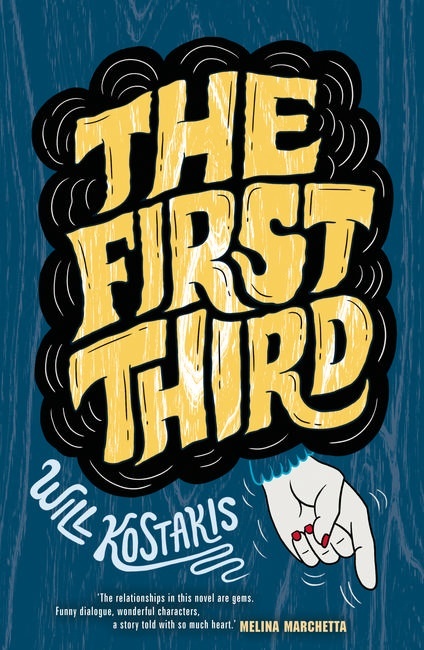 At the same time it is also a book about a teenage boy dealing with moving to that next stage of his life…the second third.